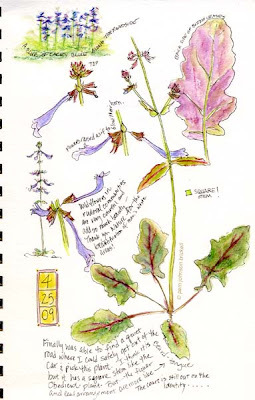 South Carolina LowCountry Nature Journaling and Art: Thank You PlantGal!! Last April I posted this field sketch entitled Beard-tongue Or ? I'm happy to say that today I received an answer to my question about the name of this plant. It also goes by: Cancer Weed. Oh my goodness! i love looking into sketchbooks...and yours is just perfect! i'm going to perk some coffee and come back here and read some older posts! love, love your blog, your style, your work...your spark! Hmmm...do you think it was called cancer weed because it was thought to cure cancer? If I haven't said before, I wanted to tell you how artful I think you are with your dates - added like true parts of the composition and colorful, too! I wish I can draw well enough for people to know what my drawing was! All my sketches just look deformed and stuff. Good for you! Pam, you blog is wonderful! Did you recently change the look of it? I must confess that I know nothing of botanicals and in fact they even run when they see me coming, but it is such a delight to see your sketches. I'll have to pop in more often. Thanks for the kind comments on my blog. I love your journaling. I don't have much time to sketch & journal anymore. I sorely miss it but I can just enjoy it vicariously through yours.